SAUDI Arabia’s groundwater resources being meagre, the kingdom is encouraging businesses to invest in profitable farming operations overseas. The move will see the kingdom bolstering its food security but also increasing entrepreneurship prospects for its citizens. A trade fair that will facilitate business partnership deals in this regard is being organised for September 7 to 10. Saudi Agriculture 2014 takes place at the Riyadh International Convention and Exhibition Centre (RICEC) and its organisers say it has successfully generated notable international interest in its features and benefits. Accredited by the Global Association of the Exhibition Industry (UFI), Saudi Agriculture 2014 has confirmed participation from 40 countries, including Morocco, Netherlands, Turkey, the UAE, Australia, Bahrain, Belgium, Brazil, Canada, Chile, Cyprus, the Czech Republic, Denmark, Finland, France, Indonesia, Italy, Korea, Kuwait, Lebanon, Malaysia, Mexico, Pakistan, Poland, Portugal, Russia, South Africa, Spain, Taiwan, the UK and the US. The show will train the spotlight on the Saudi plan to reduce water consumption while protecting local consumers against global food price volatility through incentives to the private sector to invest in farmlands abroad. The aim is to have products from those farmlands imported back into Saudi Arabia. “The government is acting as a facilitator for the Saudi private sector, seeking land and agricultural investments, and providing funds, credit and logistics. Following this shift, Saudi Arabia is seeking to invest in 35 countries across the world, planting the seeds for fruitful partnerships and joint ventures with international agricultural companies,” a statement from the fair’s organisers said. Fields represented at the fair will include agricultural building construction, animal health and production, finance and banking, machinery and equipment, chemicals and fertilisers, fisheries and fish farming, greenhouses, irrigation and landscaping equipment, and organic farming. Held concurrently with Saudi Agriculture 2014 are Saudi Agro-Food, the 21st international trade show for food products, ingredients and technologies, and Saudi Food Pack, the 4th international trade exhibition for food processing and packaging technologies. Saudi Agro-Food 2014 is dedicated to the food processing and packaging industry and features state-of-the-art products, technologies and services including frozen and chilled foods, confectionery, chocolates, healthy and natural foods and processing and packaging equipment. 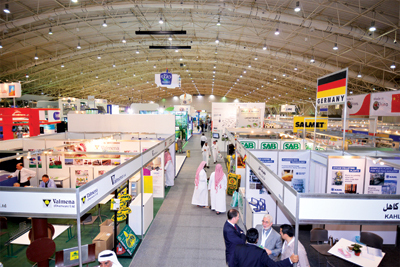 Saudi Food Pack 2014 will showcase a vast array of equipment and solutions for manufacturers and distributors of tools, machinery and services that are essential for food production and packaging as well as their display in stores and outlets.